Kerry Hannon is a nationally recognized expert on career transitions, personal finance, and retirement. She is the author of 10 books, including Love Your Job: The New Rules for Career Happiness (Wiley, 2015.) Hannon is a columnist and regular contributor to The New York Times, a contributing writer for Money magazine, AARP’s Jobs Expert and Great Jobs columnist, contributing editor and Second Verse columnist at Forbes, and the PBS website NextAvenue.org expert and regular columnist on personal finance and careers for boomer women. Find her on Twitter @KerryHannon, visit her website at KerryHannon.com, and check out her LinkedIn profile. 1MFWF: Maybe besides getting a dog, what is your number one recommendation for people who have fallen out of love with their current job (or never loved it in the first place) to move forward and find a better fit? Kerry: Take ownership of your job. 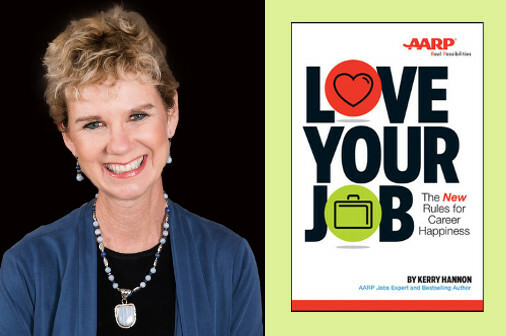 In my book, Love Your Job: The New Rules for Career Happiness, I explore how critical it is to find ways to love your work. No one is going to wave a magic wand for you. In essence, you need to plan for your future and constantly ask yourself, “What can I do to improve myself on the job and to make my work more rewarding?” not “What can my boss do for me? Change your attitude. Instead of feeling like a cog in the wheel, think of yourself as an entrepreneur–Me Inc. You’re the driver. Most of our workplace blues comes from a sense of powerlessness. Shift your internal thinking and approach. Look for new ways to add value, and keep expanding the range of “products” you sell. Ramp up your computer savvy, for instance, with a course on how to use social media tools. Depending on your job, it might be a great move to smooth your communication skills by enrolling in a class on public speaking or joining a Toastmasters group. You might upgrade your financial acumen by taking an accounting class. Focus on what you like about your work and ramp it up. Trust me, there are things. Then ask your boss or supervisor if there are ways you can do more of that. By being grateful each a day for the good parts of your job it will also give you the strength to ride out the difficult parts. Write down two or three things each day that were bright spots. In a big picture view: Consider things like your fun and smart coworkers, your sometimes energizing assignments, opportunities for learning, the respect you engender and the perks. My second big tip is to make a change—even a small one. Boredom is often at the root of unhappiness at work, although most people don’t identify it as that. One way to change that is to learn something new. Sign up for continuing education or professional development programs offered by your employer. When you acquire knowledge, you notice the world around you. Your mind turns on. It’s your responsibility to “remain relevant” in your work. If you can’t find a program at work, track one down on your own outside of the office. Often even learning something non-work related can do the trick. And a third tip: Declutter your office. Don’t laugh. It works. When people feel low on energy, often it’s because they’re not clearing out as they go. Their inbox is overflowing. Their desk is a disaster. Their file drawers are jammed. Decluttering is liberating and empowering. You are saying, “This is valuable, this is not.” It’s a physical, practical way to engage in making decisions about your life and what you want to do with it. Finally, raise your hand and ask for new duties. Dissect your current position to pinpoint a new responsibility you can add that will refresh your focus and maybe even scare you a bit. It’s ok to be nervous. Keep your ear to the ground to get the scoop on positions opening up or emerging projects—even if they’re short-term. Then throw your name into the hat. Give yourself permission to stretch. 1MFWF: In your book, you write about creating a blueprint for your dream job. Part of what you discuss is identifying what work goals are most important. How should people prioritize a list of goals? Kerry: Write a short personal mission statement. In a few key sentences, sum up what you really want in your job. If you can do it in one sentence, all the better. Make a list of what job success and job happiness mean to you. Is job success a priority in your life? Does making a great income motivate you? Does knowing you are always learning new things bring joy to your job? What are your work goals? Do you want to be assigned projects that challenge you and make you feel energized, learn new skills, have a more flexible work schedule and more control over it, cut out the commute and work from a home office, or find more camaraderie and a stronger sense of community? 1MFWF: How often do you hear people wishing for a more flexible workplace as part of those goals? Kerry: All the time, flextime is huge. When it comes to what makes people love their jobs, this is a biggie. Telecommuting employees are happier, more loyal and have fewer unscheduled absences, according to a survey by outplacement firm Challenger, Gray & Christmas. In my own research and interviews with hundreds of workers, I’ve discovered that more flexibility in scheduling day-to-day activities leads to greater happiness on the job. And this is especially true as you get older. 1MFWF: As AARP’s Jobs Expert, do you find that mid-career workers are more or less reluctant to ask for and embrace flexibility? Are there specific factors they should take into account that may be different from entry level workers? Kerry: I find that younger workers tend to be more upfront about asking for flexibility. Yet for older workers, happiness at work often revolves around having flexibility. But the truth is not all of us are in a position that permits this liberty. Many jobs demand that you be physically present. And if you’re managing a cadre of workers, you probably need to be present. The best work-at-home jobs are often those that demand a quiet space with few distractions—web-based jobs in accounting, translation, sales, public relations, medical transcription, and customer service. 1MFWF: How do you recommend people go about asking their boss for a flexible working arrangement? What makes a proposal more likely to be accepted—what steps should a worker take to ensure success? Kerry: “Improved efficiency” should be at the top of your “why you should let me have a flexible work schedule or telecommute” list. Increased productivity is, in fact, one of the leading reasons for allowing employees to work from home. Walk into the conversation with a proposal that describes what your work schedule would be, the number of hours you would work, how unplanned overtime would be handled, how often you would check in with an office visit, and how often you would talk with your boss. You might agree to work in the office when projects are being launched or problems arise that the company needs to solve. To seal the deal, ask for a trial period of three to six months so both you and your boss can see how the arrangement works out and fine‐tune it if needed. In the end, the best way to convince your boss is to show, not tell. That means that when you walk in for the ask, a solid work ethic that delivers reliable results will be your ticket to flexwork gold stars and, ultimately, your job happiness. 1MFWF: Overall, how you think we’re doing in terms of flexibility being more accepted as a net positive by employers? Kerry: It really depends on the employer and the type of work you do. If you work for a small company, you may have a better chance at wresting some control of your working day. While more employers say they provide flexible work arrangements for their employees, I have discovered, not surprisingly, that it’s squarely in your court to negotiate with a supporting supervisor. 1MFWF: Anything else you wish to share about finding a job that brings true career happiness? Kerry: Do some soul searching about what matters to you. To be honest, when I ask people about what they love about their jobs, it’s not typically the act of work itself that they love. It’s the people they work with, the mission of their employer’s organization, the constant ability to learn new things that the job offers. Sometimes it’s the chance to travel and meet new people, or, conversely to work from home. Finally, smile and laugh more. A recent Gallup survey found that workers who do this are far more engaged in their jobs. Give it a try.